The table above shows the volume of various cylinders at various pressures. For example: a steel 104 contains 82 cubic feet at 1900 psi. The table below that shows the volume of the various cylinders per 100 psi. For example: a steel 104 contains 3.9 cubic feet of gas for every 100 psi in the tank. 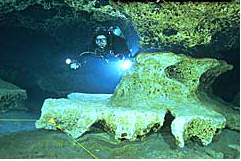 Two cave divers are planning a dive together and have different sized tanks. One set of doubles happens to be 104's filled to 3400 psi, the other set of tanks are aluminum 80's. filled to 3000 psi. In order to determine each divers time to turn the dive we have to actually calculate thirds based on volume and then convert that volume to pressure. To make an extreme example consider one diver has a tank the size of a waterglass and the other diver a tank the size of a car, both filled to 3000 psi. 3 or 4 breaths and the small tanks will be at 1/3 of the starting pressure. Many hundreds of breaths and the car sized tanks will be at 1/3 of the starting pressure. The Aluminum 80's have 154 cubic feet of gas in them (77 X 2). 1/3 of that volume is 51 cubic feet. Thus, that diver must turn after s/he has used 51 cubic feet. The double 104's have 294 cubic feet of gas in them (147 X 2). 1/3 of that volume is 98 cubic feet. We see from these calculations that the Aluminum 80's must be the tanks used to "control" the turnaround. The turn pressure for the aluminum 80's then is 2000 psi. So, after the diver uses the 1st 1000 psi s/he must turn the dive. In order to determine the divers turnpoint with the 104's you must calculate that tank pressure when 51 cubic feet has been used up. Each 100 psi = 7.9 cubic feet. So...to determine the psi for 51 cubic feet use the conversion factor & divide 51 by 7.9 and the answer is: 6.46. Then 6.46 X 100 = 646 psi. This answer means that subtract 646 from starting pressure and that is the turn pressure for the 104's. Round 646 up to 700 and subtract 700 from 3400 and get 2700 psi as the turn pressure. The park bench in Devils' system.